Christmas is officially 24 days away…are you ready?? I know I’m not. For me, Christmas shopping starts…whenever I want it to start; sometimes I find something for someone in April or July (which kills me waiting to give it or I completely forget to give it altogether). Other times I’m out there Christmas Eve crossing my fingers hoping I can find something. And lemme tell ya…this doesn’t just apply to shopping. Heck, the Christmas tree, the Christmas decorations…yep all last minute. It’s not that I don’t want to, it’s being able to find that extra time during the holidays. So to help ease your burden, and mine since I’ll be doing a few of these as well, here are 6 last minute decoration ideas for Christmas. Great for entryways – we wrap a lot of porch columns for a festive and warming entryway. Size matters here – you don’t want that big column wrapped with a 1″ ribbon (that would look a bit odd) so we typically use an indoor/outdoor 6″ ribbon for these outdoor Christmas decorations. Seems obvious right? Well, lots of people skip the greenery or just have an unlit wreath on the door. But how often do people actually get to see that beautiful wreath on your door? Probably not very often. 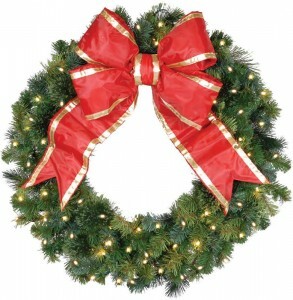 Our wreaths are already lit and come with a bow, meaning they can be enjoyed during the day and at night. Size matters here too – we install a lot of Christmas wreaths in the roof gables (the triangle part where the wall meets the roof). Gables are pretty big so typically we use a 48″ wreath for these areas. Bows make a great companion to greenery and ribbon, but also look great by themselves on a column or near a door. We use a few different sizes of bows, 18″ & 24″ being the most popular; coming with gold or silver trim or all red. 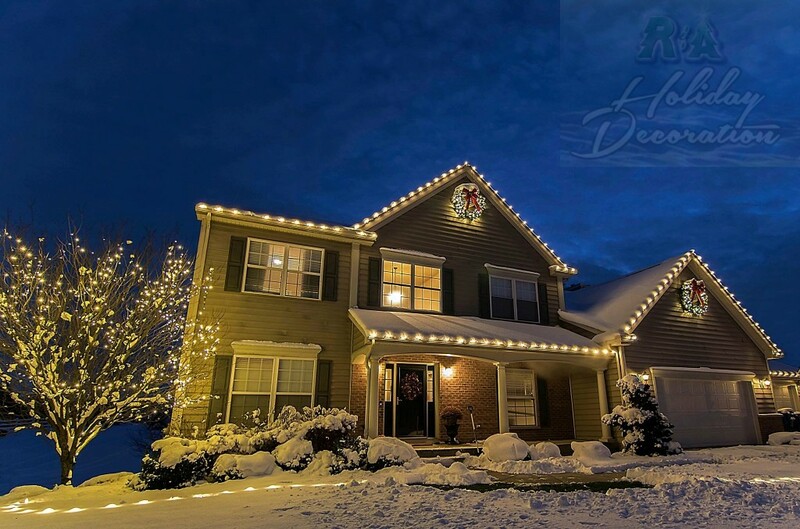 Lots of homes have flood lights for their regular landscape lighting and tend to turn them off during Christmas due to the other Christmas lights and decorations. Instead of turning that beautiful lighting off change out the bulbs to red or green for quick and simple Christmas decoration. As with flood lights, those soffit lights, which are installed within the roof overhang, those are typically left off when the holiday decorations are turned on. Depending on the type of soffit light you have, this may be another quick and simple Christmas decoration. Column drops are kind of like sprays, except a big longer, they make a perfect addition to your Christmas decorations. They are pre-lit and are finished off with a bow. As their name suggests, column drops work great on columns, but can work just as well in many different places. We hope these 6 last minute decoration ideas for Christmas will quickly help get your home decorated for Christmas. If you find that you just won’t be able to decorate this Christmas be sure to contact us to see how we can help get your home looking festive. To see some recent holiday decorating projects you can check out our gallery and our blog, or follow us on Facebook for live updates. You can also subscribe to our monthly newsletter to see ideas, quick tips, and find out what we have been up to.